Unique and very elegant! 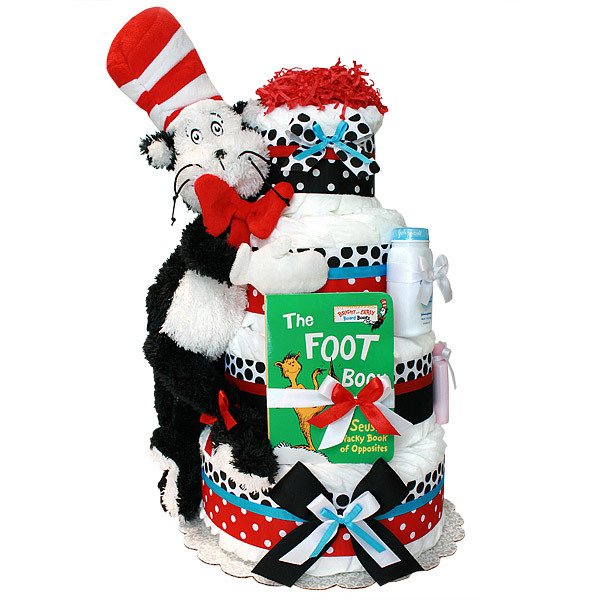 Four tiers The Cat in the Hat Diaper Cake is a great baby shower gift and a gorgeous centerpiece for The Cat in the Hat or Dr. Seuss books themed baby shower. Can also be used to welcome a new baby in the hospital room. This diaper cake is made of 95-100 Pampers Swaddlers diapers size 1(7-14 lbs. ), One The Cat in the Hat plush toy; one Book by Dr. Seuss (can vary from the picture); one JOHNSON'S Baby Powder Pure Cornstarch with Aloe Vera & Vitamin E (Gently absorbs excess wetness to keep skin dry and soft) 1 1/2 oz; one JOHNSON'S Baby Shampoo (This mild, tearless formula baby shampoo is as gentle to the eyes as pure water) 1.5 fl oz; one JOHNSON'S HEAD-TO-TOE Baby Wash (Bathe your baby in pure gentleness) 1 fl oz; one DESITIN Creamy (A creamy formula with Aloe & Vitamin E to prevent and treat diaper rash) 1/8 oz; one JOHNSON'S Baby Lotion (With that unmistakable baby fresh scent) 1 fl oz; ribbons and bows. The diapers are held together by elegant ribbons (no glue on diapers). Decorated with ribbons and bows. Ribbons are hand-stitched with white embroidery floss on the back of the cake, allowing for a clean, handmade look.